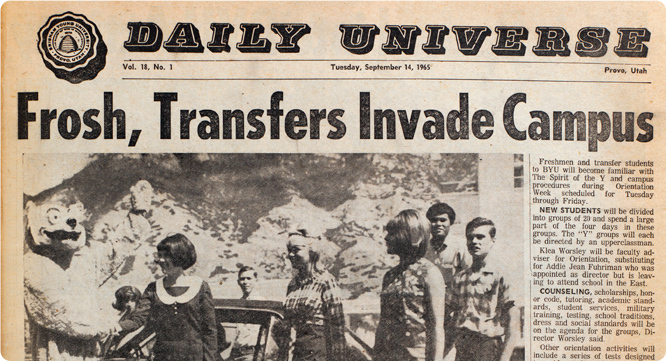 By semester's end, the Daily Universe will be printed only weekly, with all daily news coverage moving online. Read about the change, see the paper's 50th-anniversary editions from 2005, and explore memorable front pages. BYU is picked to win the national men's volleyball title. Recap the home opener in this video, where BYU took down no. 5 USC in front of a sellout crowd. La Monte Young may be the most famous composer you've never heard of, influencing artists from Yoko Ono to Bono. A BYU professor tells his story. Visiting forum speaker Mark DeMoss, an evangelical Christian and advisor to the Romney campaign, called for civility in our public and political discourse. You're stuck—caught between company loyalty and honesty with clients. To solve such a dilemma, says ethics guru Brad Agle, you must prepare. Muhammed Eissa, senior lecturer of Arabic at the University of Chicago, discusses Egypt's future in this filmed lecture. Adam Liptak, a New York Times journalist who covers the Supreme Court, shares personal insights in this video. Will the United States or the European Union save the global environment and economy? See the debate. Watch as religion professor Matthew Grey examines events following the destruction of the Jerusalem Temple. Now 101, Gwen Richards shares wisdom she gained during her century of experience and decades of teaching. This year there are student-teaching experiences up for grabs in Texas, D.C., and possibly China. Professor David Wiley was appointed a senior fellow at Digital Promise, where he will use technology to improve education. BYU has developed a tiered system that identifies struggling students and helps them without holding others back. A new study shows that blogging helps new moms transition and is related to lower stress and lower marital conflict. The University of Washington's J. David Hawkins will address youth substance abuse in next week's Hinckley lecture. What happened after the pioneers got through Hole in the Rock? Find out at the Feb. 17 San Juan Mission Symposium. Theatre Ballet presents a full-length Hans Christian Andersen classic, The Snow Queen, with a preshow party for kids. BYU opera students took first place at the National Opera Association's Collegiate Opera Scenes Competition. BYU's Living Legends will infuse their upcoming show Seasons with the vitality of dances from Bolivia, Fiji, and more. "The Orchestra Spins a Tale"
The BYU Philharmonic Orchestra will present a special family-friendly performance on Feb. 18. Hear Dean John Rosenberg's thoughts on dual immersion in this video, then see what new program BYU is backing in Utah. BYU's Linguistics Department held a panel on Utah English. Read more about BYU professors' research on Utah English in BYU Magazine. Two biology grad students earned grants from the National Geographic Society. See what they're researching. Biology professor Leigh Johnson is now the associate director for research and collections at the Bean Museum. Rosa Elena Bonilla de Lobo, the first lady of Honduras, shared hope for a healthier population in her visit to BYU. New veterans are facing invisible wounds, like PTSD, in staggering numbers. See how BYU is committed to veteran care. Join us April 6 for an all-day celebration in honor of the College of Nursing's 60th anniversary. BYU's minor in gerontology, the study of the elderly, is open to all majors, but it is especially pertinent to nursing students. Read why. The history of the Provo Tabernacle runs deep; just ask BYU geology and archaeology students. Stanford professor Richard Zare, winner of a National Medal of Science, will speak at BYU on how to be successful. Math professor Robin Roundy is now a fellow in the Institute for Operations Research and the Management Sciences. The BYU Center for Animation is moving from the Fulton College to the College of Physical and Mathematical Sciences. A transportation organization named civil engineering professor Grant Schultz the 2011 Educator of the Year. On Feb. 23 the college will host contests and more for middle school, high school, and college students. An electrical engineering class built devices to beam a song from an iPhone to speakers using a laser. Mechanical engineering professor Brent Adams won the Bunge Award at the International Conference on the Textures of Materials. BYU students wrote a brief for a religious freedom case that went before the Supreme Court. Now, see what the court decided. After 24 hours in their war room analyzing a supply chain problem, a BYU MBA team found a solution that earned a top finish. A BYU study shows persuasive packaging that leads people to buy a product may also reduce its long-term sales. See how. See the two international educators who are bringing their expertise in helping the world's poor to BYU's Ballard Center. A BYU professor is working to send a nuclear-powered drone to the Saturn moon Titan. Enter this BYUtv contest for a shot at a free trip to Las Vegas for the WCC showdown. Ever-popular BYU guitar professor Larry Green tells his secret on picking a guitar. The newest Sperry Symposium volume explores the rich symbolism of Lehi's dream.